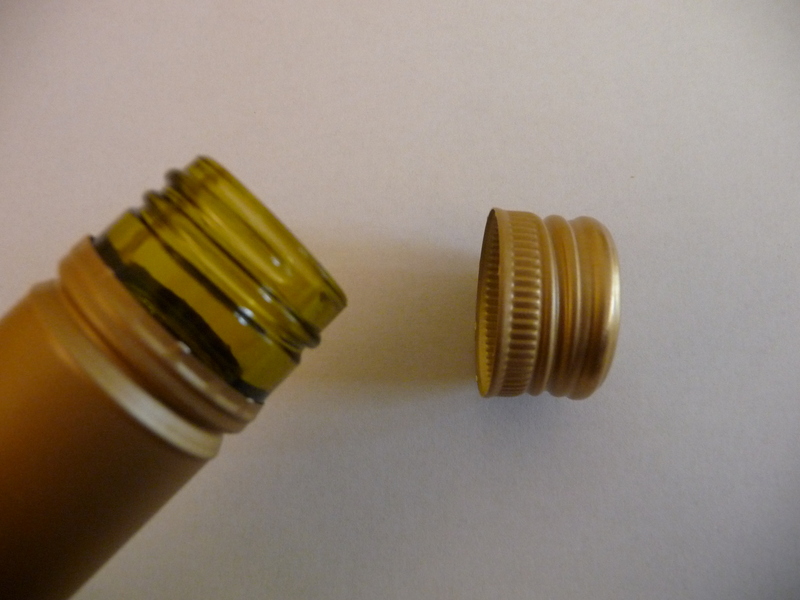 A recent development in wine bottle closure that I almost hope takes hold is the screw cap. I have to admit, I am as old fashioned as the next guy, when it comes to wine in any case. I love hearing a cork being pulled out, it’s the sound of happiness for me. When I hear it in a restaurant I usually exclaim ‘Mazal Tov!’ I also love to play this little game with my wife, without her knowledge. This is how it goes: She is quietly reading in the living room at the end of the day. I secretly pull out a bottle a wine, insert the corkscrew, turn it, turn it and then quickly pull out the cork to make as loud a popping sound as possible. I can almost feel her ears perk up to that familiar sound as she wonders what bottle I just opened. Inevitably, she stops what she is doing and saunters into the kitchen. Ah, the games we play. So, with all these fun and games, why do “I love screw tops”? This one is for you, Daddy Winebucks. One evening last week we are sitting around the kitchen island, our usual hangout. Kathryn is busy at the stove, I am reading, Hannah is playing with her bunny and Ben also has his head buried in a book. By the way, before you get all Steinem on me, we usually take turns around the stove and Ben often makes pancakes for Mommy on his days off from school. So, Kathryn says, “Honey, can you get me a glass of wine?” Before I have a chance to respond, Ben opens the fridge and takes out a bottle of white wine. He proceeds to screw open the cap, fill up a wine glass, hand it to my wife and then he says, “Is this ok, Mommy?” My wife is flabbergasted…and pleased. Now Ben is a smart and dexterous guy, but he is only seven and he cannot do that with a bottle that requires a cork screw. This beats the romantic sound of a cork popping out any day! You’ve got me beat! Well done, Ben. My 7-year old, also named Ben, could barely lift his finger away from the TV remote watching Sponge Bob, let alone get my wife a glass of wine. I’m proud of him and jealous at the same time. Thanks for the great blog – such a good read! Thanks for the nice comments. I have not seen the glass closures yet, sounds like it has the same benefits of screw-cap with potentially less image issues. A lot of the consumers associate screw-caps with lower quality but I think the tide is turning as more and more of the high end wineries introduce them. So, anything that makes it easier to get to the wine for more people is welcomed by me. I think we will need to give this glass closure a road test and let you know. Do you remember the wine brand?